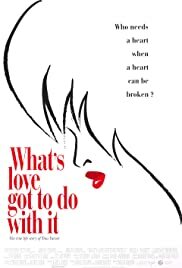 [LAST TITLE CARD]: "What's Love Got To Do With It?" hit number one. Tina's first solo album won four Grammy Awards including Record of the Year. It was gratifying to see rock legend Tina Turner earn the coveted Kennedy Center honor last month, certainly reason enough to revisit this wonderful biopic based on her 1987 self-affirming autobiography, "I, Tina" co-written with Rolling Stone editor Kurt Loder. Directed by the late Brian Gibson in an appropriately feverish manner, the 1993 movie still burns brightly thanks to the electrifying performances of Angela Bassett and Laurence Fishburne. There have been several fine performances in biopics of late - Jamie Foxx in "Ray", Joaquin Phoenix and Reese Witherspoon in "Walk the Line" - but I still feel Bassett and Fishburne maintain the high watermark as they seem to inhabit the roles of Ike and Tina completely in this film. Adapting probably the most melodramatic parts of Tina's book, Gibson and screenwriter Kate Lanier built a dramatic framework about the former Anna Mae Bullock that is somewhat standard-issue and probably biased, but it works on a visceral level as a story of personal triumph punctuated by some of the most gut-wrenching scenes of domestic violence captured on film. Playing one of the most recognizable and enduring celebrities in the rock world, Bassett manages to capture the physical mannerisms, vocal patterns, and onstage energy of the real Tina, even though her voice obviously had to be dubbed. With her almost distracting musculature, she convincingly rips into all her musical performances with unabated fire, but it's really in her dramatic scenes, especially when she becomes an increasingly degraded victim of her husband's demons, that she soars. Fishburne has an extremely tough role, as he has to transcend the inherent villainy of Ike by displaying the bravado and talent that brought the pair the spotlight in the early years. He brilliantly manages to imbue a spirit that is at once frightening and pitiable. With a relatively sparse filmography, Gibson provides surprisingly sturdy direction here, often using an effective faux-combination of grainy home movies and TV programs to make the movie feel like a "Behind the Scenes" rock documentary. I particularly liked how he edited the inevitable "Proud Mary" - complete with gyrating Ikettes and Tina in her classic cave woman mini - to show the passage of time between the late sixties to the mid-seventies. Unsurprisingly, no one else makes nearly the impression of the two stars, though Jenifer Lewis has a few funny moments as Tina's mother Zelma, and Vanessa Bell Calloway does what she can in her switch from hard-bitten back-up singer to becalming Buddhist. Regardless, see it for two actors - sadly underutilized since this movie was released, the wondrous Bassett in particular - giving all they have into this memorable movie. The DVD has no significant extras other than the original trailer.